A spacer bead is very important in every project, whether making a necklace or an earring. Jewelry Designer, Grace Zarfati created a wire spacer by simple techniques of coiling and formed it into a daisy like flower, thus, where the name Daisy Flower Spacer came from. And with a little embellishment of beads you can use the Daisy Flower Spacer and create a whole new jewelry piece, such as earrings or pendants. This beautiful butterfly can be used as a pendant, a charm or a brooch. Its wings are shaped; spreading out while showing a netlike wire, patiently and intricately weaved to cover the wings. The wings are embellished with a bead, as if ready to hover around your neck attached on a chain or beads of necklace. Creating this piece uses wire work techniques and is suited for intermediate and advanced level. 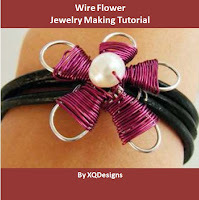 This tutorial shows how to make a flower using wire and beads. It covers basic skills such as shaping flower frame using wire, wire wrapping the flower, attaching beads onto the flower, attaching the flower onto a leather necklace. This is a wonderful beading pattern to guide you how to make this bracelet! Using only the 2-needle RAW beadweaving technique, you’ll be able to create a beautiful bicone crystal bracelet. You can also choose any kinds of beads to create the bracelet, but learning the basic RAW technique, you’ll be able to create numerous designs and even turn this bracelet into a necklace. Learn how to make this classy looking beaded necklace using swaroskvi crystals and japanese seed beads through this pictorial step by step tutorial. It is suitable to be worn for dinner function that makes you look elegant! Making chain maille can be a lot of fun, and with some practice and patience it is a skill that can be added to any jewelry-making arsenal. Chain maille is a jewelry making technique of linking metal rings or jump rings and creating a pattern.There are only 2 important techniques a jewelry maker should be familiar with when it comes to chain maile and that is opening and closing jump rings/metal rings. In this tutorial by XQDesigns, we will teach you how to open, close and link jump rings through a simple chain maille pattern called Persian Star. This is a chain maille jewelry making project that uses combination of European 1 in 4 and Whirlybird techniques. It requires only basic supplies such as jump rings and beads. You can mix and match using different materials and colors of jump rings as well as beads to come up with many beautiful variations. The tutorial comes with pictorial step by step guides. You can turn the Cabochon to a pair of earrings or pendant. Here’s another simple and beautiful chain maille design created by XQDesigns. The piece is a double purpose piece because it can be used as a pendant/necklace or earrings. In this tutorial, we have added a bonus on how to use it as earrings. Chain maille is a technique that if you only use your imagination you can create wonders with it. Like with the Easter Basket Necklace, you can add more jump rings and make the piece wider or bigger and add more seed beads all around. Thanks Miss Susan Puckett of Port Orchard, Washington for suggesting the name Easter Basket for the tutorial! Another tutorial for a wire crocheted jewelry designed by Naz Garces and XQDesigns. Naz Garces used white round glass beads which gave the necklace a formal look, with the white color really standing out. You too can create this beautiful necklace and choosing the right colors of beads, you can create a different mood for your necklace. Just with knowledge of basic crochet chain stitch, though at first it may seem the wires are tangled, but wearing it on your neck it will look “Pretty Tangled”. The tutorial comes with detailed and clear step by step guides and pictures. Though it is designed for intermediate student, a beginner should be able to pick it up as well.